Order your own copy of Streets of King's Landing at your local retailer or online through our website today! Summer fades in Westeros and the shadows extend their reach in George R. R. Martin’s A Song of Ice and Fire series. In the capital city of King’s Landing, Cersei Lannister contends with the zeal of the Faith of the Seven and their newly restored army, the Faith Militant. Across the Narrow Sea, Daenerys Targaryen struggles to maintain her hold on Meereen as the Sons of the Harpy plot her destruction. Finally, at the Wall, Jon Snow attempts to forge a peace between the wildlings and the brothers of Night’s Watch while met with resistance on all sides. In order to survive the games of cloak and dagger that fill the pages of A Dance with Dragons, the leaders of each House must embrace the darkness, lest they risk their downfall. But how far can they go before they become lost in the game of thrones? 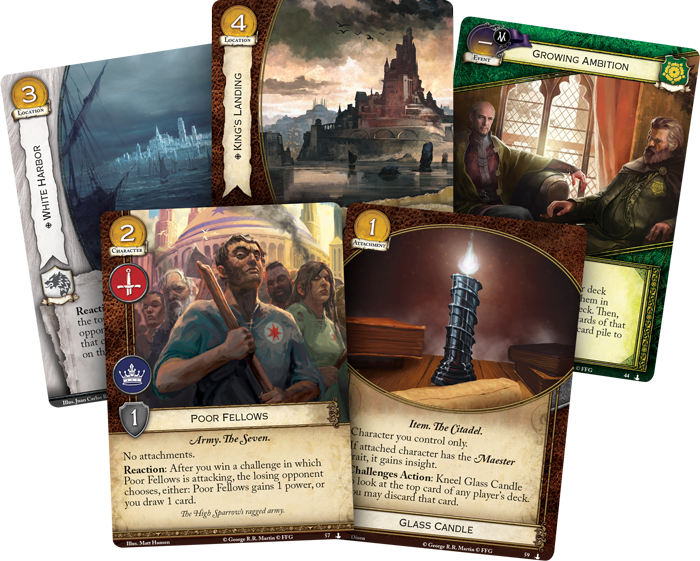 Fantasy Flight Games is proud to announce Streets of King’s Landing, the third Chapter Pack in the Dance of Shadows cycle for A Game of Thrones: The Card Game, now available for pre-order at your local retailer or online through or website! 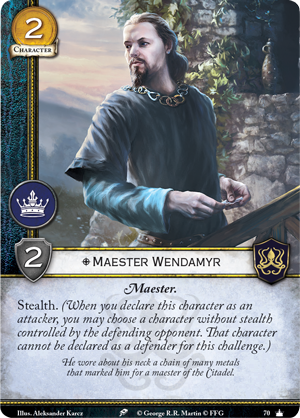 Your struggle for the Iron Throne becomes tinted by corruption and underhanded plots with the reintroduction of the player-favorite shadow mechanic. This keyword, originally used in the game's first edition, creates a new space to hold some of your most secretive cards, separate from your hand and play area. 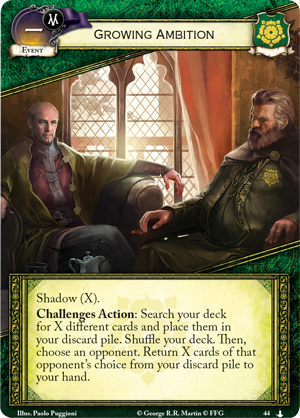 Cards with the shadow keyword, also marked by the distinctive dark banner in the upper left corner, can be played normally… or you can pay two gold to marshal them into shadows where they remain hidden from your enemy until the perfect moment. When the time to strike arrives, you can take an Action at any point to pay their shadow cost and play the card. However, with this new keyword come certain cards that can't be played normally. For example, Growing Ambition (Streets of King’s Landing, 44), is a new event that does not have a gold cost, meaning you must marshal it into shadows. Yet this event also does not have a set shadow cost, instead allowing you to pay any amount of gold at your disposal to play it. But the more gold you're willing to invest, the easier it will be to assemble your plans. If, for example, you pay four gold to play Growing Ambition, you may then search your deck for four cards of your choice and place them into your discard pile, shuffling your deck afterward. Then, your opponent will choose four cards from your discard pile to return to your hand. If you can play this at a time when there are no other cards in your discard pile—or fewer than four cards—you can ensure that you have at least some of the cards you want in your hand when you need them. With this powerful ability waiting in the wings, your ambition is only limited by your ability to fund it. In King’s Landing, the loyalties of the common folk are not only divided between the noble houses, but also by the religions that have begun to take a stronger hold in Westeros. As the nobles fight amongst themselves, it is the poor who die in their wars. This disconnect has led to a resurgence of the vengeful gods of old, and those who speak the words of their god have been given unprecedented power. 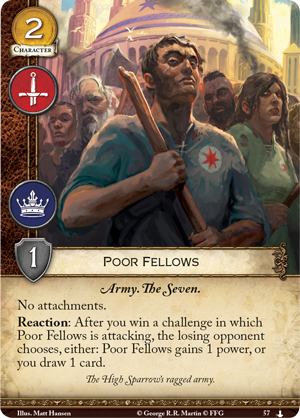 The High Sparrow (The Faith Miliant, 97) is now protected by his ragged army of Poor Fellows (Streets of King’s Landing, 57) who have grown restless and will have their voices heard. Once the Poor Fellows win a challenge, your opponent must choose to allow the Poor Fellows to gain a power or allow you to draw a card. Little by little, they will reclaim the power that the royals have been hording for far too long. But religion is not the only force gathering strength in the Dance of Shadows cycle. As magic returns to the realm, things once thought of as impossible have become the everyday; dragons darken the skies, the dead march against the living, and long inanimate artifacts find renewed life. The Glass Candle (Streets of King’s Landing, 59) burns for the first time in a hundred years, allowing its possessor to see across mountains, seas, deserts, and even your opponent’s deck. 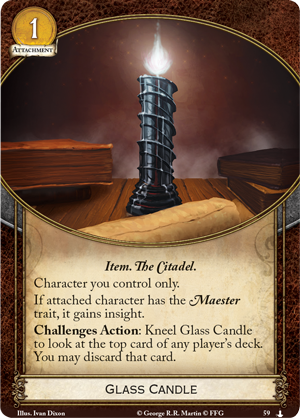 As a challenges action, you may kneel Glass Candle to look at the top card of any player’s deck and discard it if you so choose. 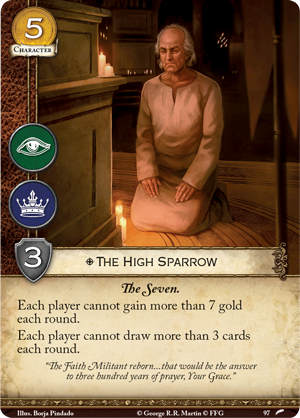 Furthermore, if the character bearing this attachment is a trained Maester, such as Maester Wendamyr (Core Set, 70), who can use the candle’s full potential, they gain the insight keyword, increasing your ability to draw cards from your own deck. But despite this power, you must look on this miraculous attachment with a sense of foreboding—if the glass candles are burning, what other fabled feats are possible? What terrors lurk just over the horizon? The age of strife is coming to a close. With the strengths of so many great houses diminished by the War of the Five Kings, the common folk are ready for an end to the bloodshed, and Westeros is ripe for the taking. Prove that you have the strength to restore the realm to its former glory and take your place on the Iron Throne! 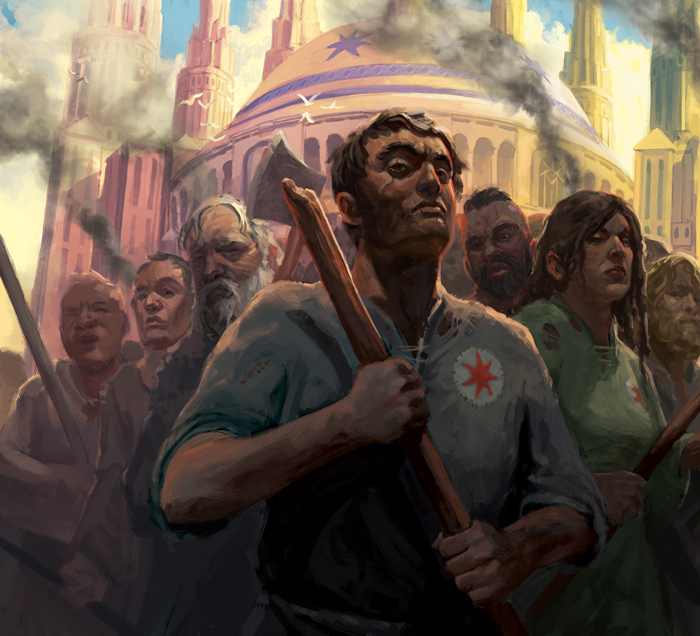 Pre-order your copy of Streets of King’s Landing (GT33) at your local retailer today or on the Fantasy Flight Games website here! 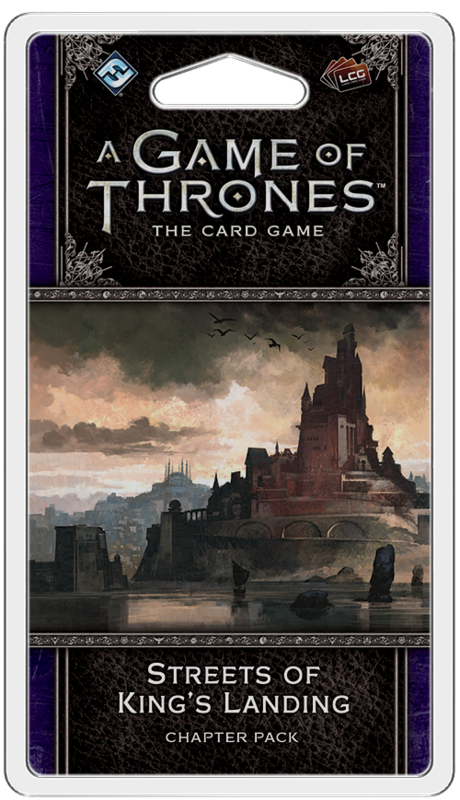 A Game of Thrones: The Card Game Second Edition is the second edition of a beloved Living Card Game®, challenging players to take command of the Houses of Westeros and battle to claim the Iron Throne! By succeeding in military challenges, cunning intrigues, and political encounters, you may have the chance to rule the Seven Kingdoms, but those who fail will fade into ignominy.